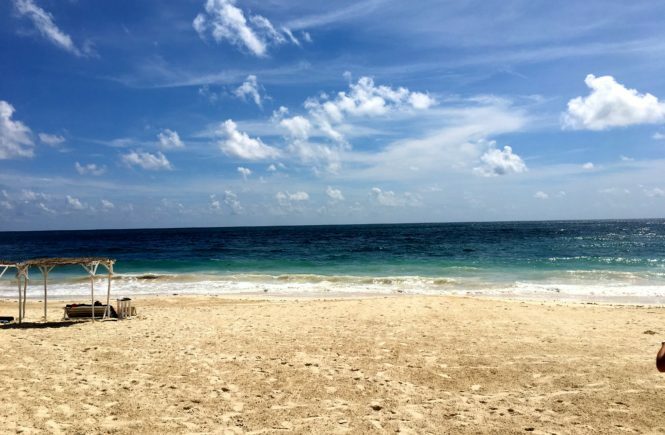 Our decision to go to Cabo happened on a whim really. 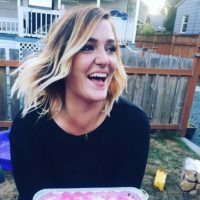 My cousin pitched the idea about going for her birthday, and within 2 hours we had flights and hotel booked. I’m obviously not to be trusted. 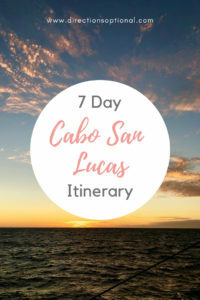 Since I’m not usually one for places as touristy as Cabo San Lucas, we decided to build our own itinerary, planning part of it before we left, and letting the rest fall into place. Our flight touched down in the late afternoon and we caught a pre-booked Speedy Shuttle to Comfort Inn & Suites. While I wouldn’t recommend the hotel for many reasons, I’m still glad we didn’t opt for anything all-inclusive (not really our style). Once we were settled in, we headed into town for food. We caught the local city bus into town and headed to the marina area. If you’re not comfortable with that, grab a local taxi but be prepared to pay significantly more. Walking the marina will be lovely once they are finished with the repairs, but in the meantime, be prepared to get bombarded with people trying to get you into their restaurant. Jet-lagged and hungry, we surrendered to La Galeria for a cocktail. There are a lot of higher end restaurants here, so you’ll pay close to western prices, but it’s not a bad option, purely out of convenience, on your first night. 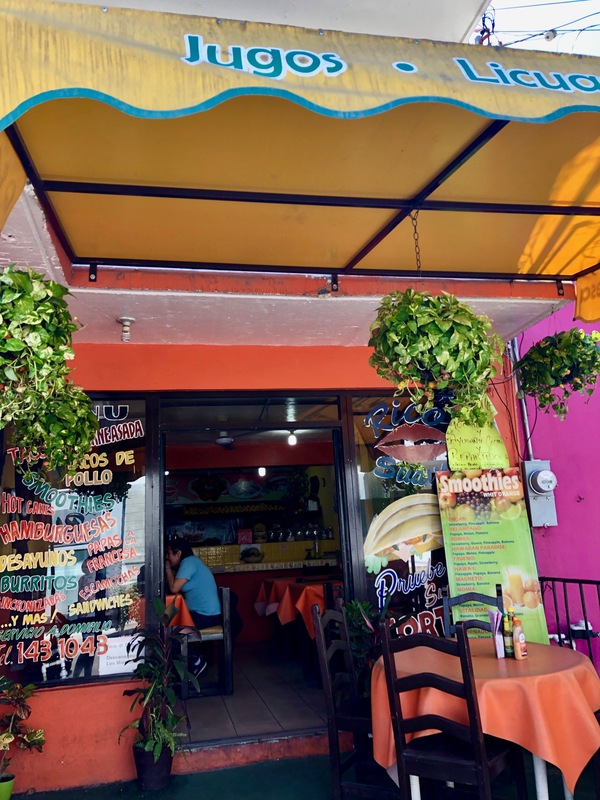 Instead, we’d recommend heading down the side streets and find more of a local vibe like La Taquiza. A belly full of tacos and a handful of margaritas later, we called it an early night and caught the bus back to our hotel. 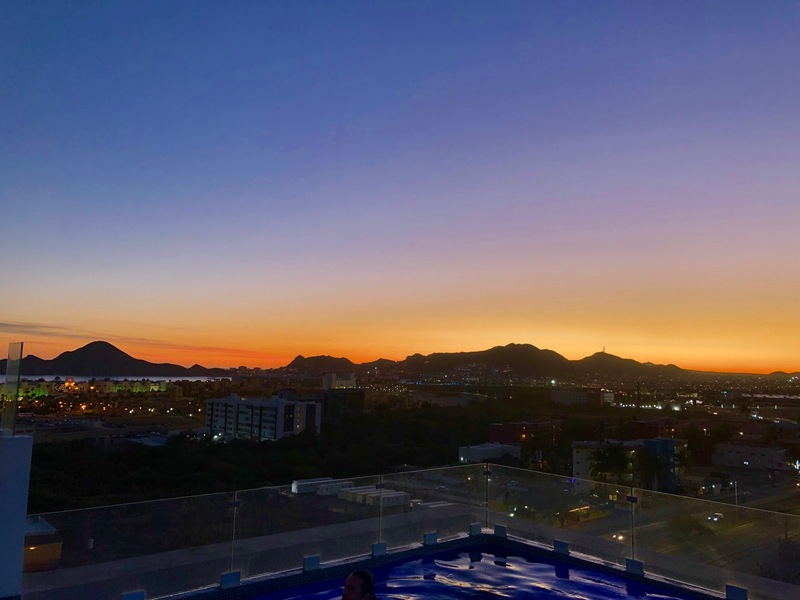 Sunset view from our rooftop pool. The first of many margaritas at La Taquiza. After a full nights sleep, we grabbed continental breakfast at the hotel and hit the rooftop pool. A slow start to the morning, but by midday we were back on the bus and ready to explore the town. The first stop on our list was Rico Suave, a spot that came highly recommended for smoothies. They did not disappoint and kept us going as we walked around. Heading towards the more popular beach area, we grabbed a late lunch at Mako Veggie & Vegan. 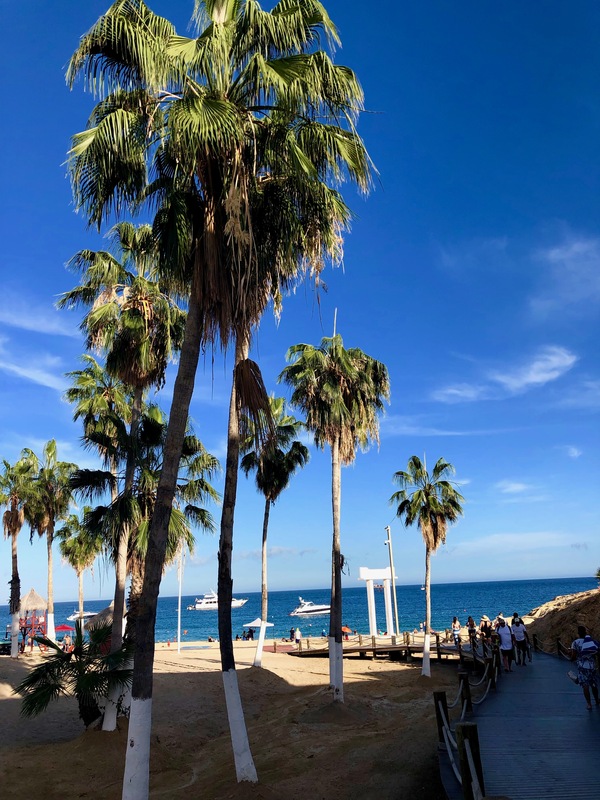 The main beach in town is Medano and you’ll find heaps of beachside bars here. We stopped at The Office which was brightly colored and looked like a pretty good time. Unfortunately, our $15 margaritas were the worst of the trip, so we didn’t stay long. This area is great to party, but not so great for a more casual evening. We walked back towards town and hit Tapes, a 90’s themed sports bar for a few beers. We even ran into some Seahawks fans and had a good chat. 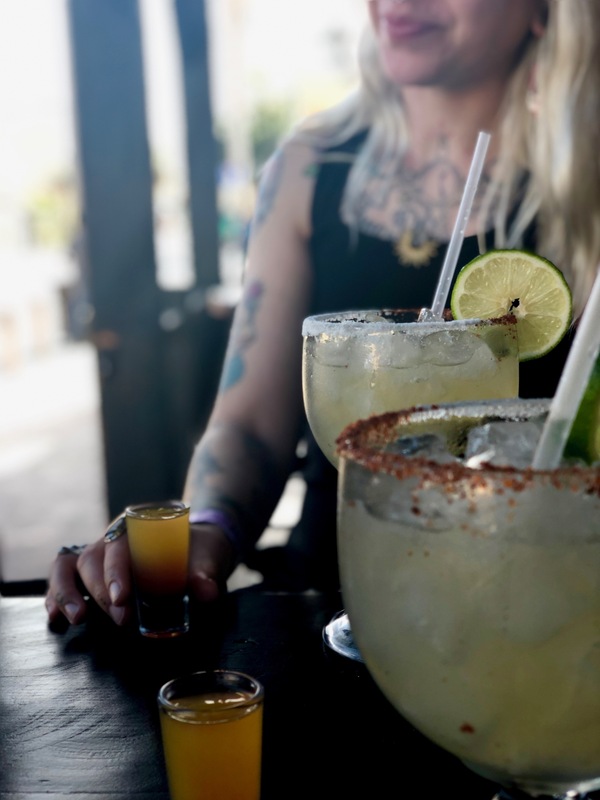 If all that walking hasn’t gotten you hungry again yet, stop by any spot that offers a ‘2 beers & 2 shots‘ for $5 or $6 and chat up those you’ll find also partaking. Ready for more tacos, and now a little tipsy, we walked around the corner back to La Taquiza. Rico Suave serving the best smoothies in all fo Cabo. Colorful view from The Office. A small breakfast at the hotel and we made a beeline straight into town to locate some better coffee. While I’ll never say that Starbucks falls into that category, they do offer free and fast wifi. So if that’s what you’re looking for, I get it. Otherwise, any of the local spots can make you much better coffee. Having checked out the popular Medano Beach the previous day, we went on a mission to find something more low key. On the other side of the naval docks, you’ll find the local beach Playa Empacadora. There are no bars, no one trying to sell you anything, and no facilities. But it is quiet and gorgeous. Bring some water and book, and enjoy! Back in town, we stopped at Baja Kosher for lunch and then 2×1 margaritas at The Saloon. Check-in for our Eco Cat Sunset Cruise was at 4:45 pm, but they have a full restaurant and bar if you’re there early. The cruise offered an open bar, buffet snacks, and a DJ. You’ll cruise the Arch, watch the sunset, and if you’re as lucky as we were, even see some whales. It was well worth the $80 each (cheaper if you get the passport). We found more tacos (surprise) before hopping the bus back. The famous Arch at Land’s End. 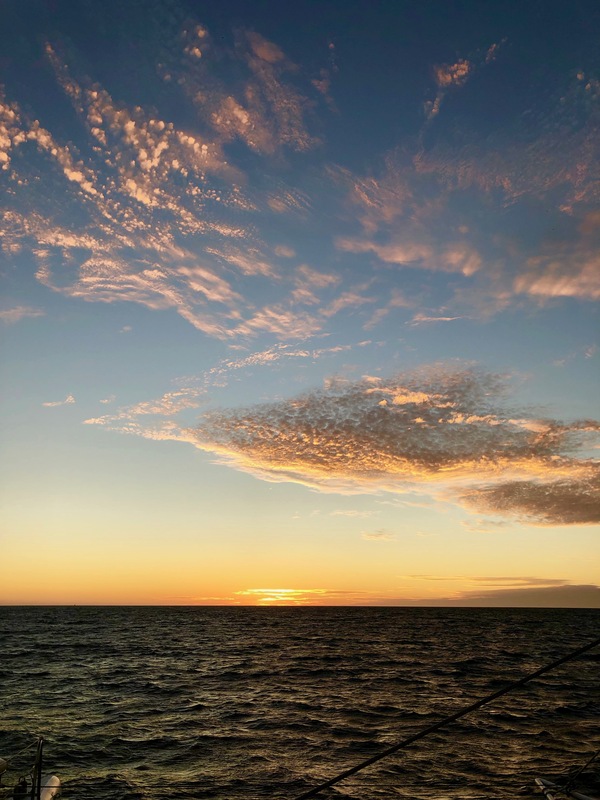 Nothing better than an incredible sunset on the water. We spent another morning at the pool after breakfast to get some work done before hitting the town again. We wanted a relaxing day so we grabbed some lunch and went searching for the markets. There are 2 big ones we found, one in the corner by the marina, and one a few blocks up. We scoped out some prices and made notes of what we might want to pick up before leaving. These are street markets, so be ready to barter. We lazed about town for the afternoon and decided to treat ourselves at Il Forno for dinner. Knowing we had an early alarm in the morning, we called it a night before 9 pm. 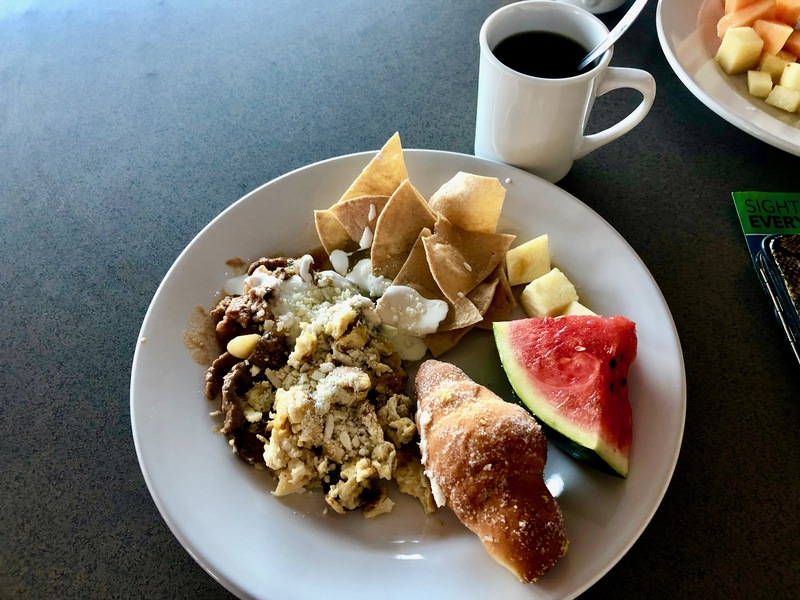 Chilaquiles, fruit, and coffee served at the hotel. So many colorful options at the markets. Some of the dishwater I ended up buying. 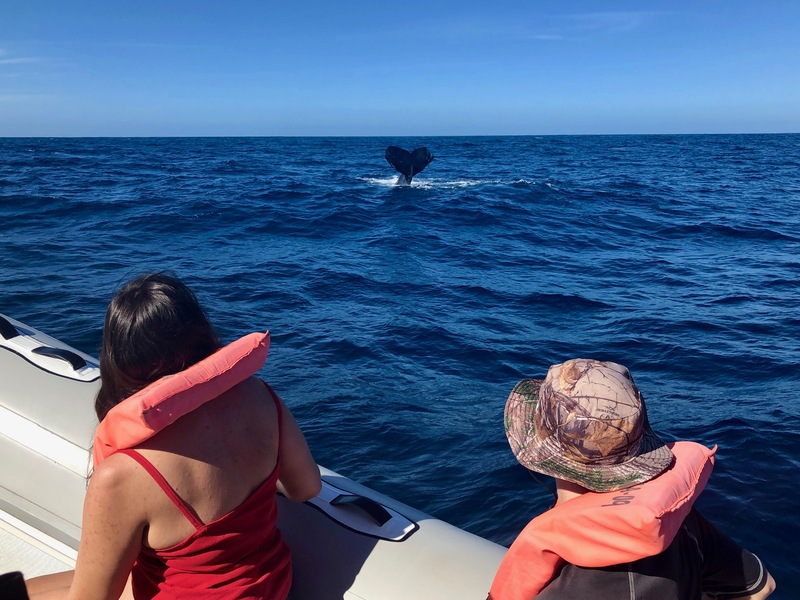 We prebooked out 9 am Whale Watching tour with Cabo Adventures. 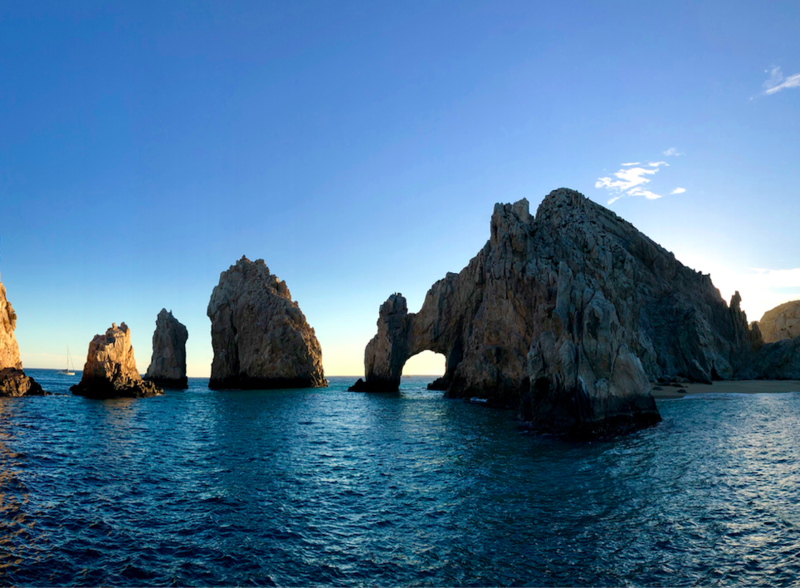 This is a must-see on any Cabo San Lucas itinerary. They had a shuttle that came straight to our hotel to pick us up and take us to the dock. After a fairly easy check in, we hopped on the boat (glorified raft, really) and headed out. It ended up being really incredible, though the pictures won’t do it any justice. The smaller boat allowed us to get up close and personal (following guidelines) and it was worth it. We saw several whales and even got to catch the dolphins playing with them. 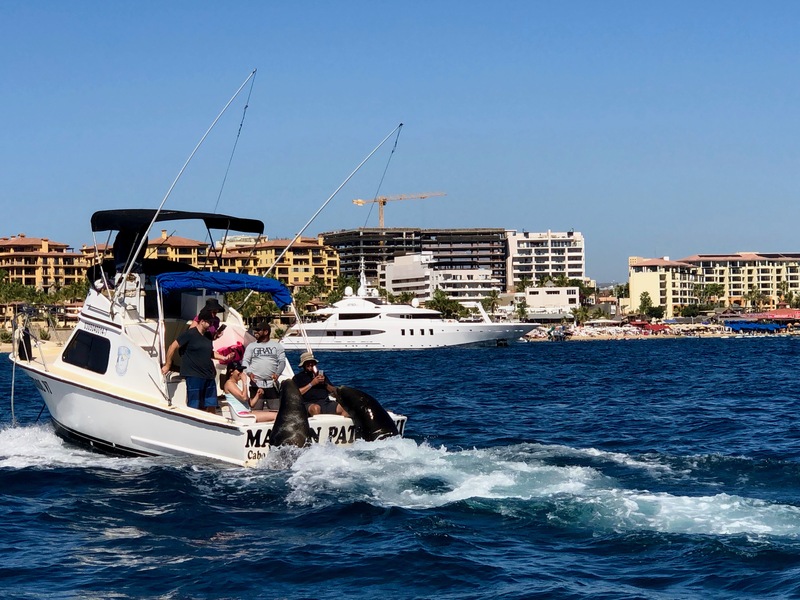 We caught some big air on the swells coming back in, so opt for a larger vessel is you’re prone to seasickness. There were also a few little friends looking for a ride into the bay and a little breakfast for themselves! I’m always apprehensive about group tours, but I’d absolutely recommend this one. We chose the early one so that we’d have the rest of the day to spend in town. A quick return to the hotel for a shower before we were back in town. We headed back to grab some smoothies and add a little rum to them while we walked around. 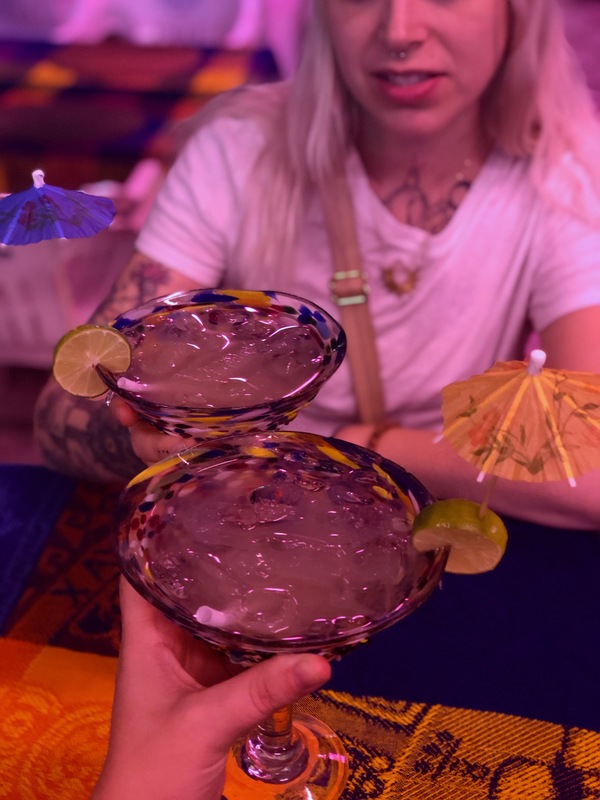 We caffeinated ourselves at a cute little tucked away shop and then grabbed some more 2×1 margaritas at The Saloon. It was my cousin’s birthday, after all. At the bar, we booked a snorkeling tour on a whim through the bartender’s friend. 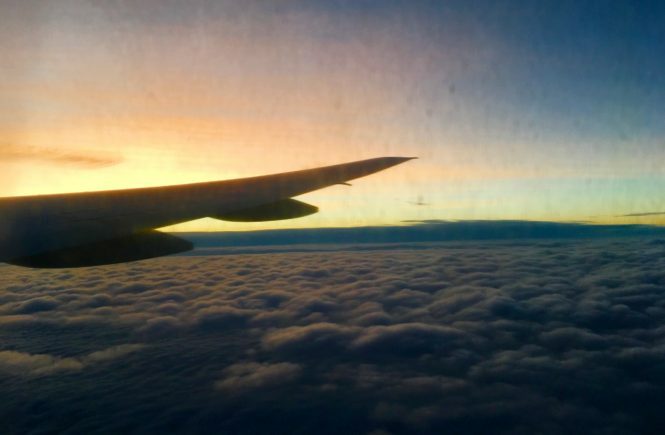 I like to leave space for these kinds of things during a trip because you never know where it may lead you. After a good handful of drinks, we filled our bellies with more tacos and headed off to bed at a reasonable hour. Two of the many Humpback whales we saw. Just hitching a ride and getting hand-fed. Moses even made her a handwritten sign. Birthday margaritas accompanied by a few birthday shots. Allowing ourselves to sleep in a bit, we picked up the rental car just after 9 am. We only booked the car a few days in advance through Expedia and got it for $35 total for the day. 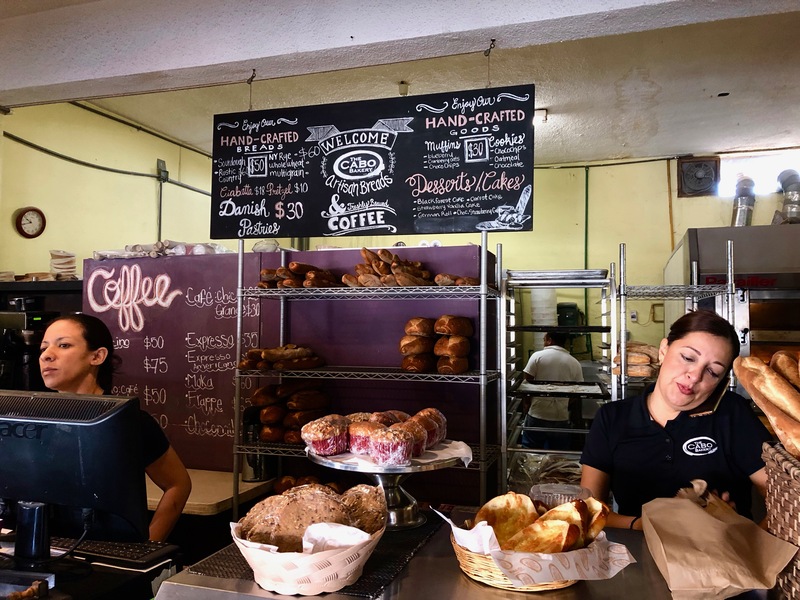 Needing breakfast and coffee before hitting the road, we finally made it over to The Cabo Bakery, and it did not disappoint. We had been going back and forth between driving to Todos Santos or over through Santiago to find a waterfall. After asking several locals what they thoughts, we opted for Todos Santos. Only an hour and a half drive from Cabo, its know for it local artists and cute little shopping areas. While we really enjoyed the shops and cute little side streets, we found it to be much pricier than Cabo. 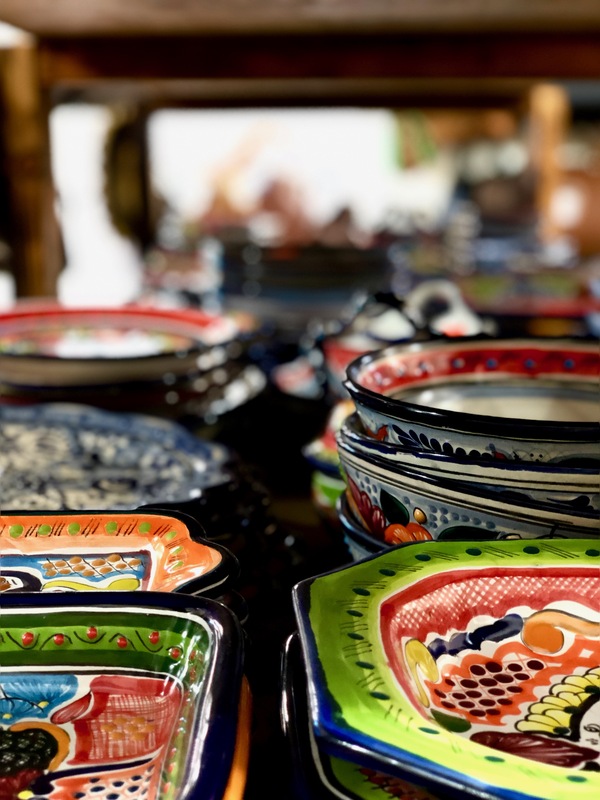 While I would normally opt for supporting local businesses, the serving dishes I had been looking at were more than 4x the price than Cabo. 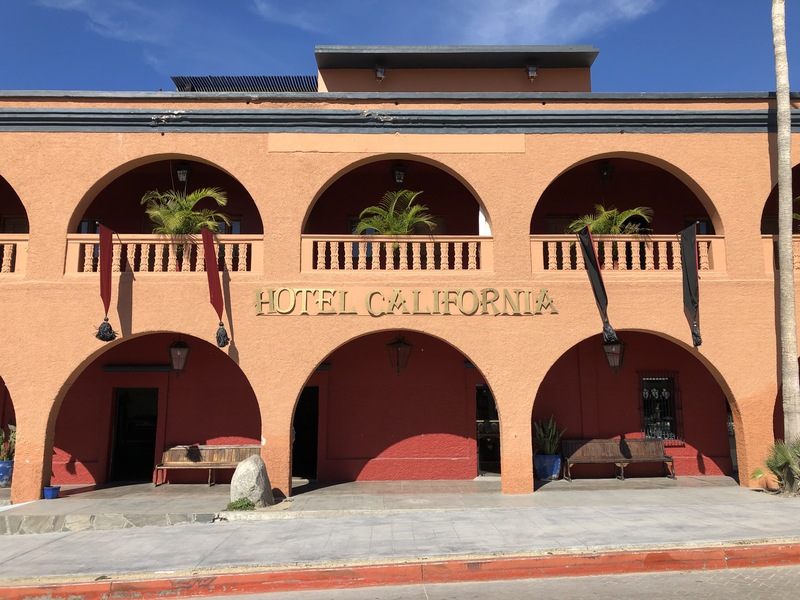 It was still a beautiful town and we even got to snap a photo of the iconic Hotel California. The downside to Todos Santos is that there is no beach access, so we headed just a bit south to the surf beach at Cerritos. The beach was large and not too busy, which gave us the perfect chance to catch some rays and relax a bit. Having a bit of daylight still left, we cruised back through to the other side of Cabo and hit Chileno Beach. While this beach may have been a bit busier, it was stunning. The water was a deep royal blue and the palms towered over your walk down to the beach. By now we were starving and went on a mission to find La Rana Vegana. It’s a veggie and vegan restaurant that had great reviews, but it tucked back up in the residential hills. If you’ve got a car, do what we did and find it in the daylight first. It is essentially the back deck of a house, but its quiet and charming and the food was absolutely incredible. Though I’m not even vegan, I’d still recommend this spot. It was the perfect end to a rather busy day. 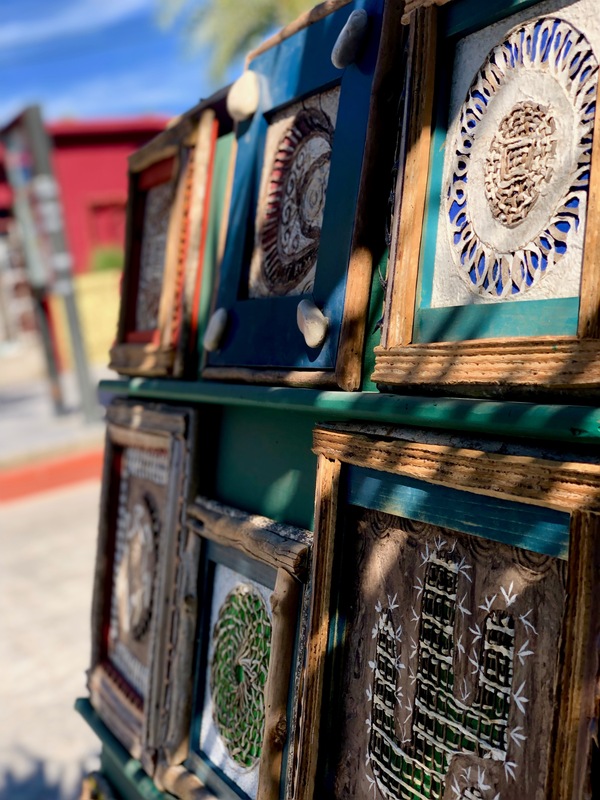 There is so much beautiful artwork in the town of Todos Santos. A windy view of Cerritos. Walking down to Chileno Beach. Cabo Bakery was calling us again, so we opted for breakfast there again once we got into town. We sipped coffees and walked around the marina until reporting for out snorkeling tour on La Princesa II. The 3.5 hour catamaran tour was only $60usd each and included gear, lunch, and an open bar. Unfortunately, the day ended up being overcast and a bit on the chilly side. Of course, that isn’t the boat’s fault, so I’d definitely recommend this tour because I think you get more bang for your buck. 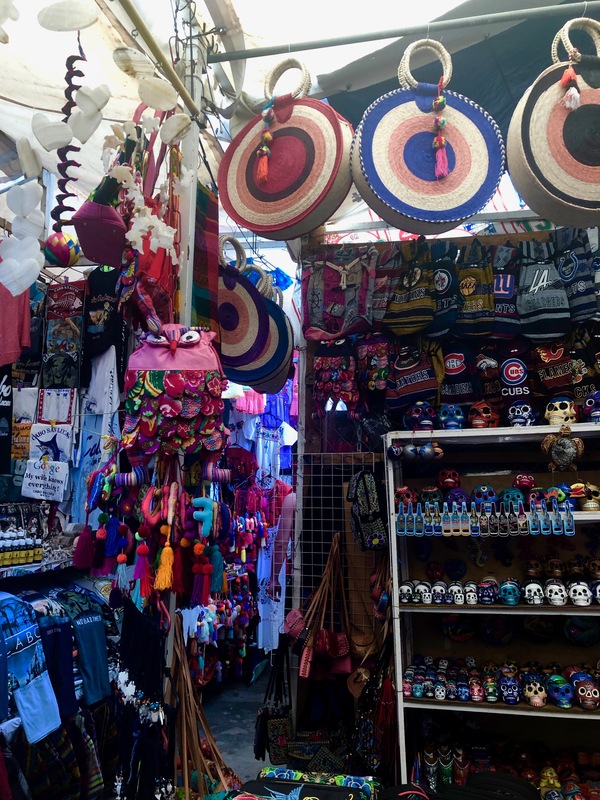 Feeling like we had done our due diligence shopping around, we hit the markets to pick up any last minute souvenirs. I opted only for a few salsa bowls, but the markets are part of the experience whether or not you’re looking to buy. A quick margarita stop at our favorite spot and then back to Mako for dinner and dessert. While our flight wasn’t leaving too early, we wanted to have time to relax and hit the pool before late checkout the next day. A bit chilly, but worth it. 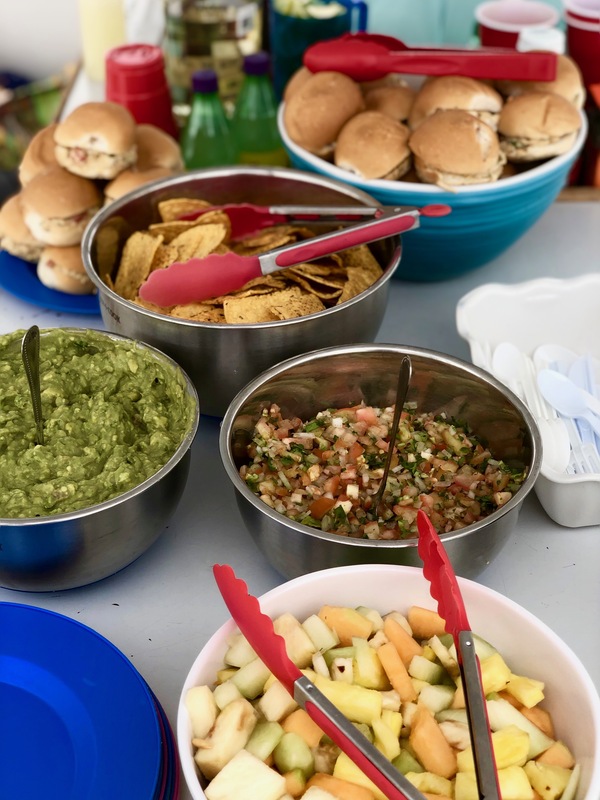 The spread, made fresh on the boat while we snorkeled. 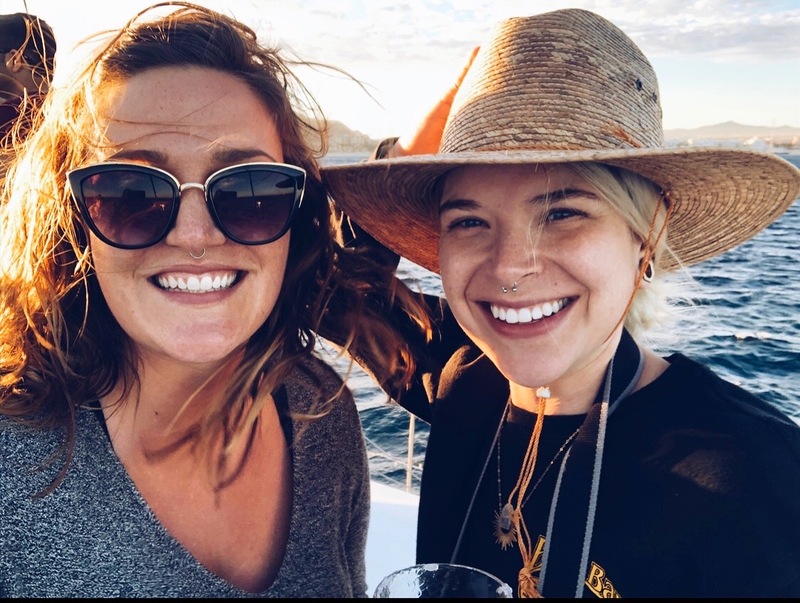 Pro Tip: We ended up purchasing the Los Cabos Passport with saved us money on tours, meals, and coffee. I’d recommend it if you’re really looking to get the best bang for your buck. 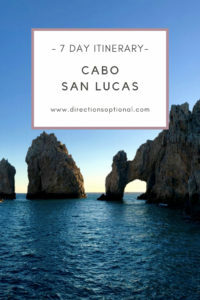 It will definitely help guide you through your own Cabo San Lucas itinerary. All in all, I enjoyed Cabo. The really touristy bits aren’t my favorite, but getting out on the water is what it’s all about. 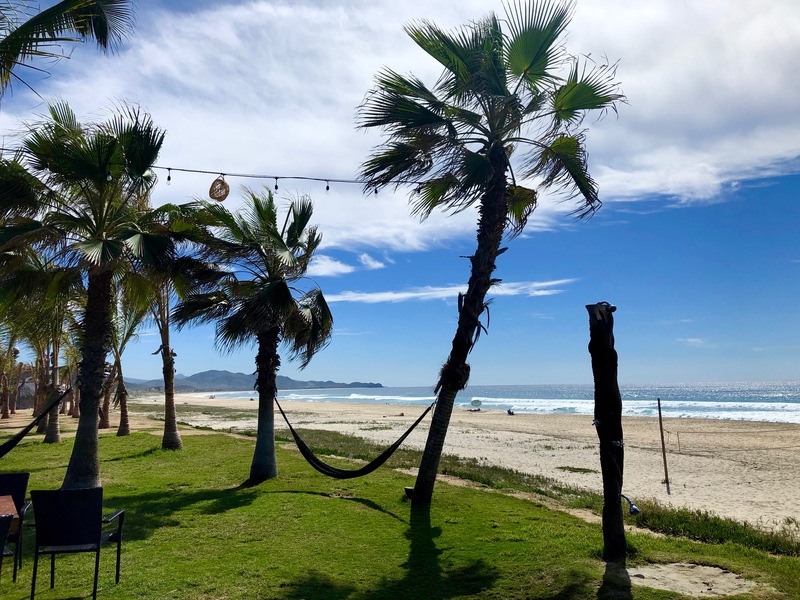 Next time I’m on the Baja, I’ll stay in San Jose del Cabo or just make it a full road trip! 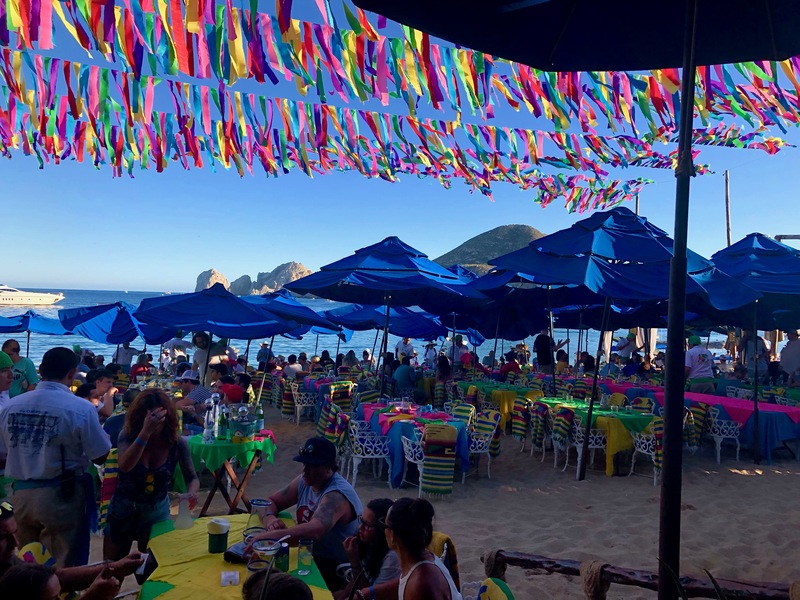 I’ll be posting more about our favorite restaurants and things you need to know about visiting Cabo, so stay tuned! I want to go!! This look so beautiful! thanks for the insight! You guys must be very good at random excursions. I mean you decide to go to Cabo and in two hours everything is done plus flights? wow. I like the circular bags at the market. If they had smaller ones I world have spoit myself. Is whale watching an all year round thing to do? 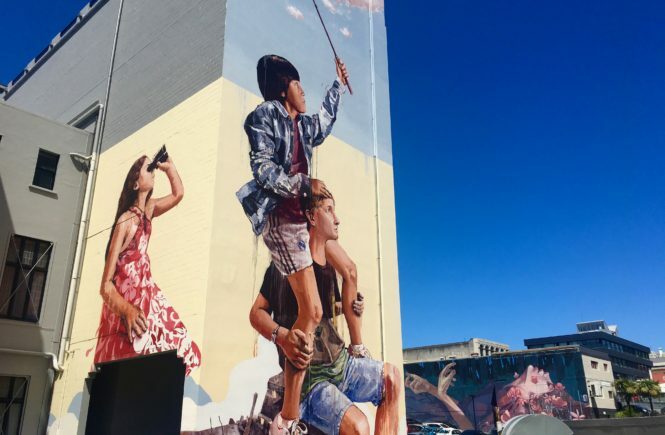 You spent your days nicely with creative ideas other than the mainstream touristy stuff to do. Cabo looks great! I expected it to be a lot more crowded. Nice to see you enjoyed your itinerary there! Gimme all the margs and chips and guac and salsa! 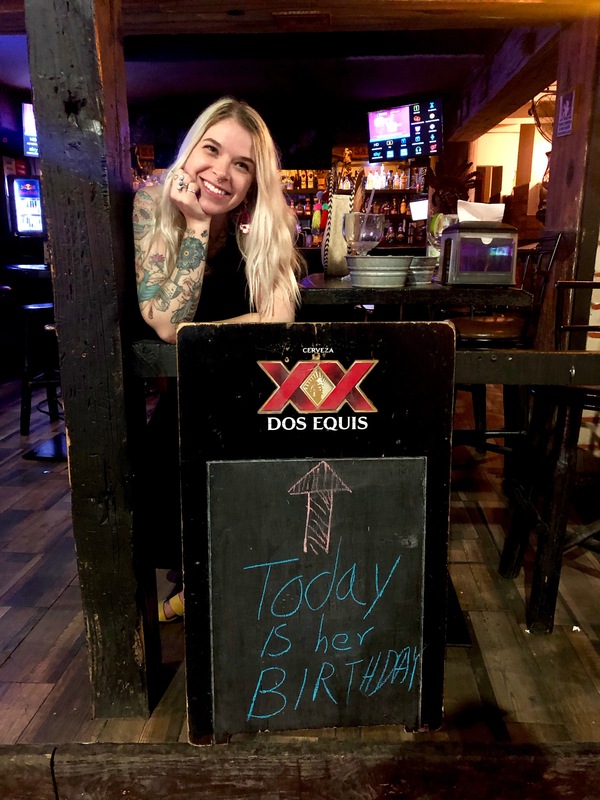 Looks like Cabo San Lucas is a great birthday getaway. 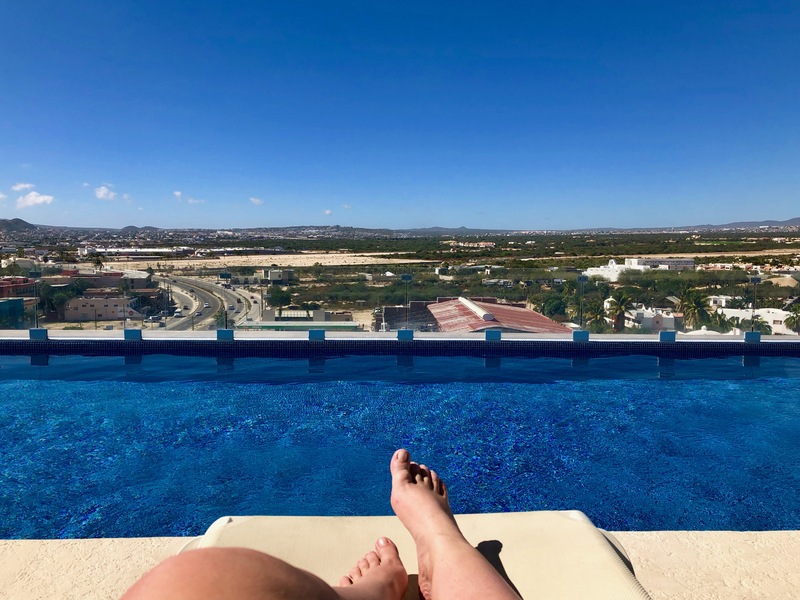 Girl, this Cabo blog was on point and makes me want to book a flight like today!! That water looks sooooo beautiful!! & THOSE WHALES!! Amazeballs. This looks like a perfect trip! 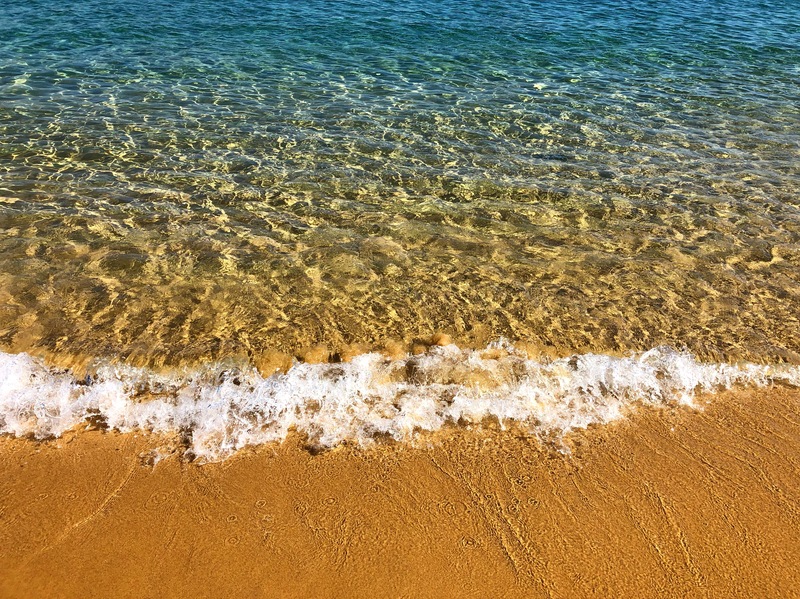 And OMG those beaches look absolutely stunning…that makes it worth the trip down alone. Between the weather, that water and the amazing food this looks like the best place ever for a relaxing holiday! 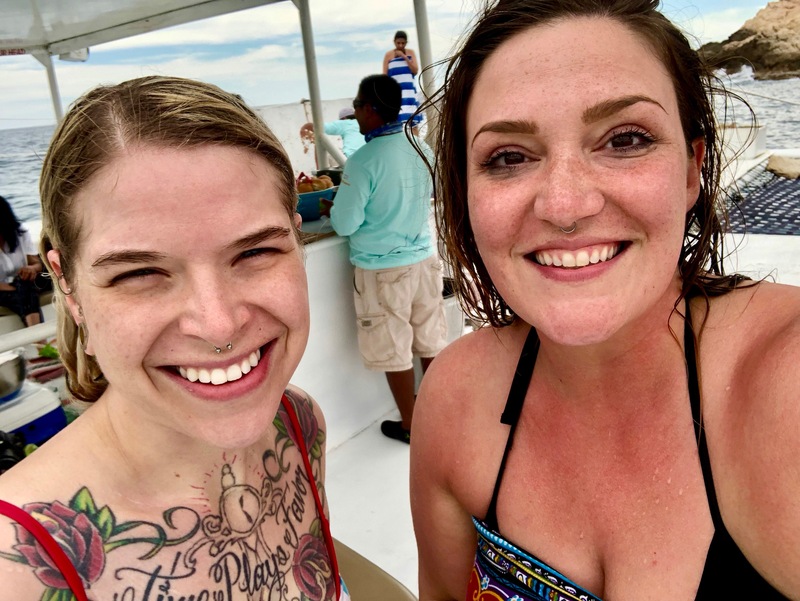 It looks like you had such a good time in Cabo San Lucas! 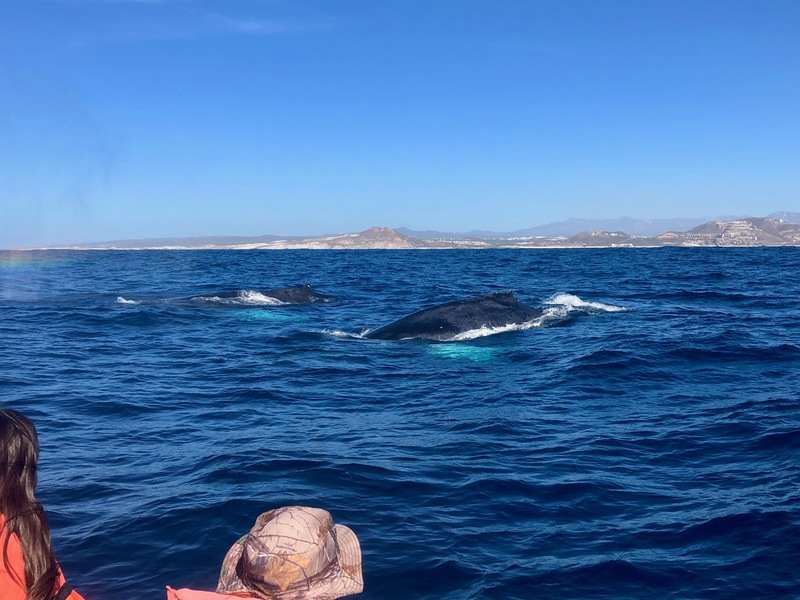 The whale watching must have been amazing – to be so close to such amazing creatures is a real treat. I love visiting the local restaurants and eateries when I travel too! Great itinerary for Cabo. I am forwarding the link to a friend too. Glad you ditched the all inclusive. Will pin! 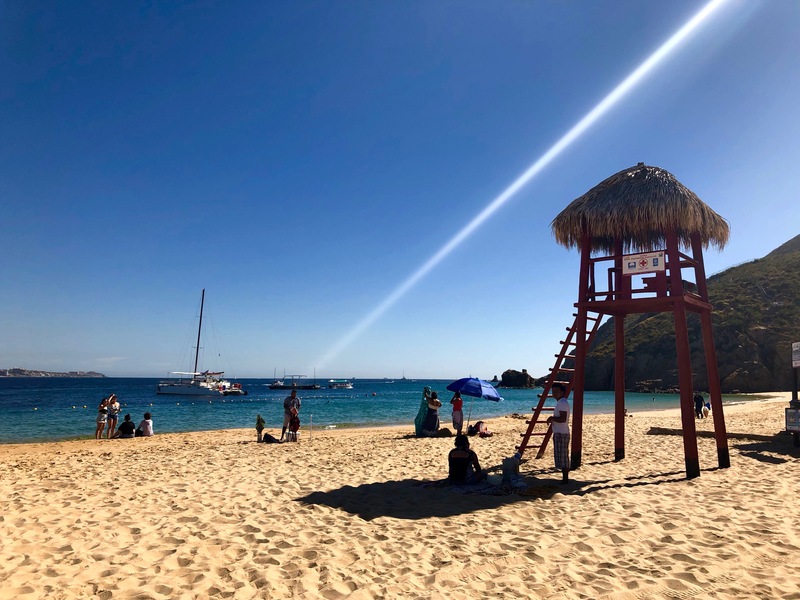 Cabo is a super-popular destination for people from my city (direct flights!) but I’d never been interested because I was worried it was too resort-focused. 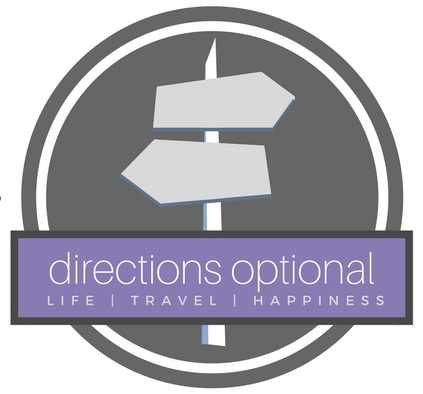 I love seeing that you skipped the all-inclusive and organized your own adventure!